Welcome to the April issue of Weight Watchers magazine! 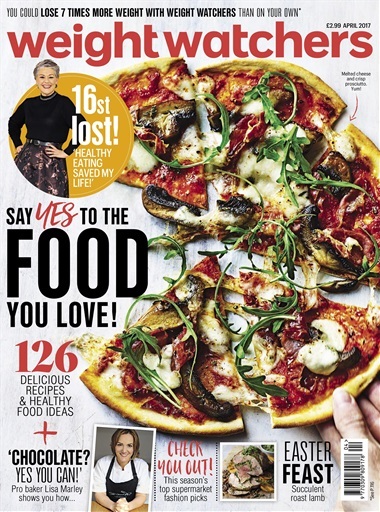 This month we’re saying yes to the food we love. Whether it’s a fancy meal out, Saturday night pizza with friends or even a deliciously rich chocolate pud, we prove that you can enjoy food in all its forms – and still get to goal. Meet Lisa and Sophie, two inspirational members who redefined their relationship with food to become healthier and happier than ever. It’s been the journey of a lifetime for Lisa C, who’s rediscovered her appetite for life after losing an astounding 16st. Her moving story will inspire you to reach for your goals, no matter how challenging the journey might seem. For Sophie – who struggled to maintain a healthy weight while leading a busy social life ¬– getting to goal while dining out just didn’t seem possible. So she set herself a challenge, to sample restaurants nationwide as the Weight Watchers Official Eating Officer and still stay on track. Plus, professional chocolatier Lisa Marley shares how she’s lost 2st while still enjoying the sweet stuff. There’s lots of it, and it’s delicious! The WW Kitchen team serves up SmartPoints-friendly dishes that will also please a crowd; we share members’ favourite dinner recipes from our new cookbook; and give some of your beloved snacks a sensational makeover. 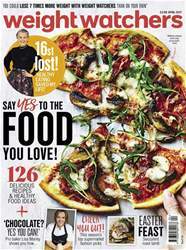 Plus, there are lunch ideas you’ll love, beautiful baking, a weeknight meal plan and a family feast that’s perfect for Easter Sunday. We explore the power-packed nutrients that can help you achieve better fitness, beauty and wellbeing. There are clever ideas to make your kitchen a happier place to be and foodie escapes for those who want to relax, unwind, and sharpen their knife skills.